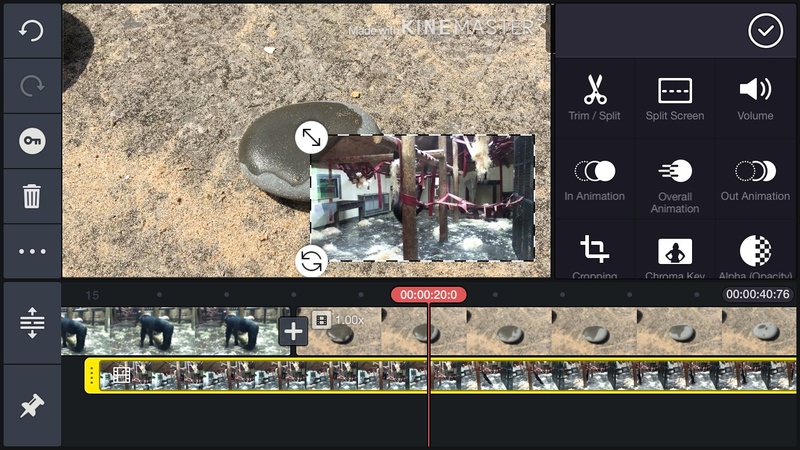 Editing on a computer is one thing, but the amazing versatility of our mobile devices means you could shoot some footage, edit it and upload it, all on a single device. There are many apps that offer this versatility to a lesser or larger degree, and we’ll be exploring where on this continuum KineMaster for Android and iOS stacks up. For a mobile app that works on phones and tables and that is essentially free, it packs quite a punch. Most mobile video editing apps attempt to simplify the creation process by limiting the number of available options. KineMaster seems to have successfully turned this expectation on its head, and has provided a simplified interface with quite a lot of advanced features crammed in. KineMaster’s interface is well thought out and the tools on offer change depending on what’s selected. 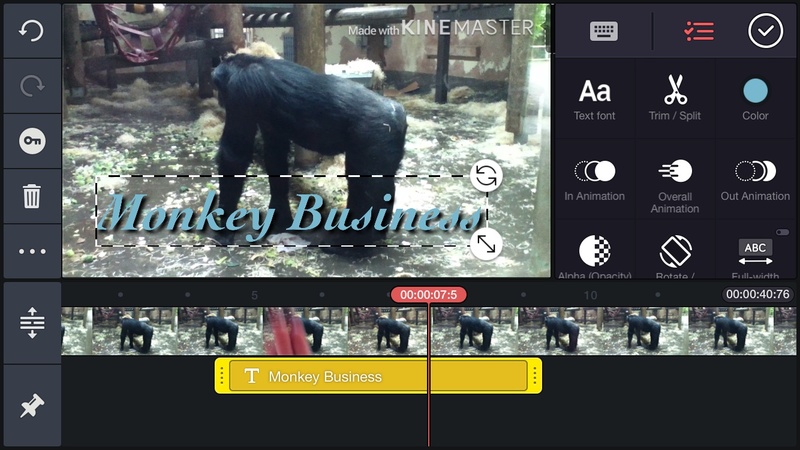 The first thing you notice is that like other mobile video editors, KineMaster doesn’t have a media section that lists a project’s available clips. Instead, it relies on your device’s camera roll. This means that you need to import the clips you want to use as you’re using them. It’s not the most ideal of solutions because you can’t preview your footage, and set in and out points for the portion you’d like to use; you have to do that after having inserted the clips in your project. This seems to be a universal limitation of working with mobile devices, but it doesn’t stop experienced editors from being frustrated by it. The working interface is cleverly designed. To the left is the Action Bar whose tools change depending on what’s selected in the Timeline. The Timeline itself is at the bottom – although if you’re used to editing in other apps and on other platforms, be advised that the convention is reversed: if you want a clip to overlap another, you must make sure the former is placed underneath the latter. This takes a bit of getting used to. 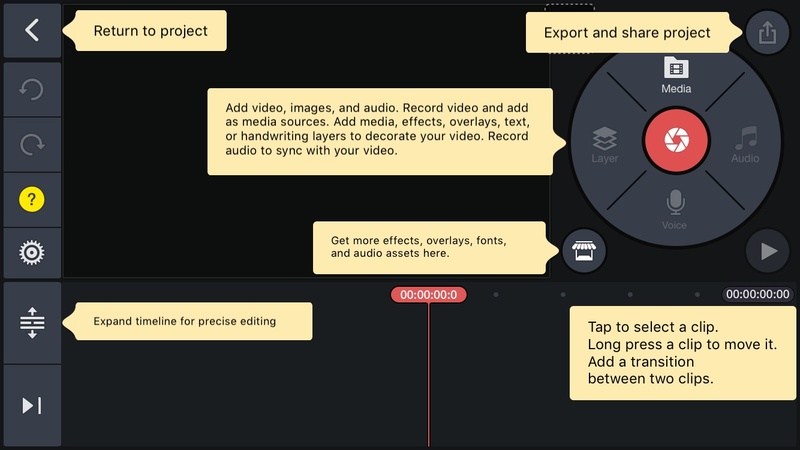 The Media Panel is the large circle to the right, where you can import media, record a voice over, create new layers for various types of overlays, delete a selected clip, or access the KineMaster Asset Store. Selecting a clip not only alters the Action menu, it also replaces the Media Panel with contextual tools. For instance, tap on some video footage in your timeline to get editing tools, or choose a text layer to gain access to the font selection, colour and formatting tools. It’s a very intuitive process which allows you to pack a lot of power in the small phone screen. 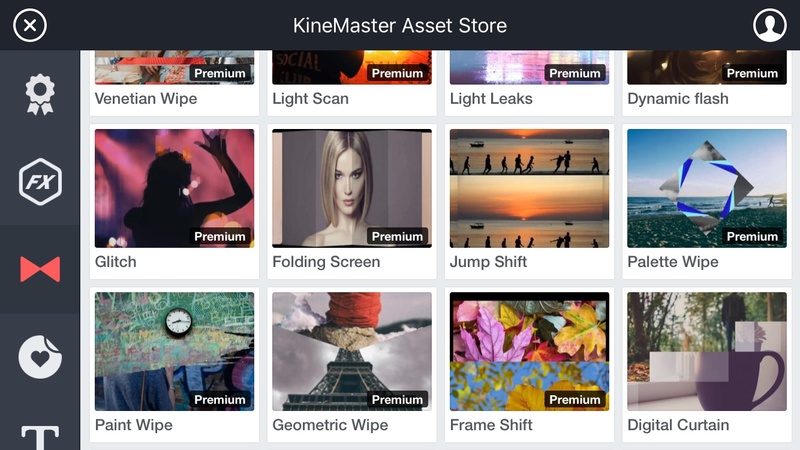 Depending on the power of your device, KineMaster allows you to work on multiple layers of video in a project. Overlays (like text and stickers for instance) are less computationally intensive and KineMaster appears to let you have as many of those as you need. The first layer is known as the Primary Timeline and KineMaster doesn’t allow gaps in it: delete one clip and any others to its right move to the left until they join with the rest of the edit. This is useful and allows you to build an edit fast. The Secondary Timelines don’t have this restriction and you can add anything there wherever you need it – as long as it’s over a Primary Timeline clip (the Primary Timeline sets the project’s duration). You have access to a plethora or tools, like colour adjustment sliders, cropping, rotation, opacity, and there’s even a chroma key tool. You’ve got a slider to control the speed of any given clip. Any clip not on the Primary Timeline can be altered with the use of keyframes. The creation of them is remarkably easy and you can tell the developers have worked hard on every facet of this editing application to offer powerful features in an intuitive and compact way. If you like transitions, adding them to your project is incredibly easy, although this can be done solely on the Primary Timeline. Once two clips are next to each other, a large ‘+’ appears where they join. Tap on it to reveal the list of available transitions, organised by categories. You don’t appear to be able to alter a transition’s duration however. Effects (like animation and gaussian blur which are installed by default) are applied via the Media Panel and are placed under other layers in the Timeline. Should you be on the lookout for additional effects, you can find them through the KineMaster Asset Store. That store grants you access to additional effects. Many of the available assets are free and you can simply tap on their download button to get them. A vast number of them are labelled premium and can be acquired through a subscription service. Others require a one-off payment. Before you shell out any money though, you can preview each effect to make sure it’s right for your project, and your wallet. Once you’ve finished your project, it’s time to export it. KineMaster offers you a choice of resolutions from 360P to 4K. Set the Frame Rate and the Quality you’re after, and tap on Export. You’ll find that top right of your completed video features a small “Made with KINEMASTER” watermark. That’s the price you pay for having access to all these tools for free. There are two ways you can get rid of this watermark. Only Android owners can take advantage of the first option: make sure you use one of Muserk’s audio tracks somewhere in your video (you can access them via the Media Panel’s Audio section), and the watermark’s gone. Sadly, this doesn’t apply to iOS owners, so they’re left with the second option: to purchase a subscription. $6.41 (£4.99) a month (or $50 (£38.99) a year) not only removes that watermark, it also grants you access to all the premium effects in the Asset Store, with new ones being added monthly. 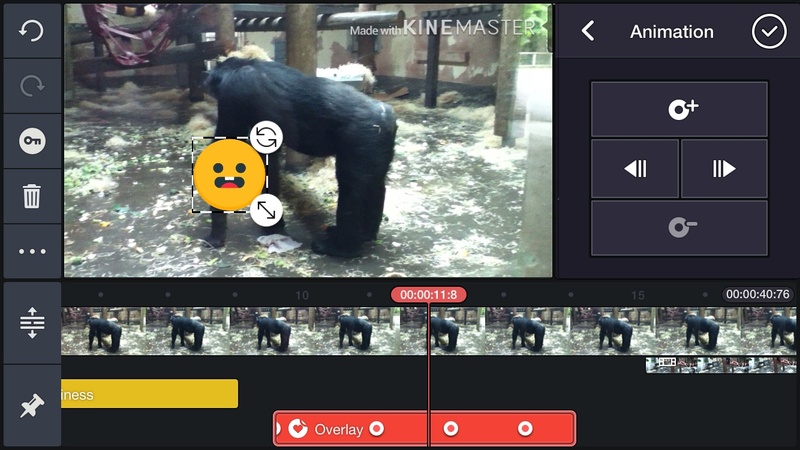 KineMaster is a surprisingly powerful video editing app for your mobile device and you can find yourself creating complex projects with ease. The interface is simple yet stores a lot of tools, and as it’s free (as long as you don’t mind the watermarking), it’s definitely worth checking out.